American humorist Dorothy Parker (1893-1967) once wrote caustically that "Men seldom make passes at girls who wear glasses." Her comment tells as much about the eyeglass fashions available in her youth as about the customs of flirtation. Ms. Parker would be pleasantly surprised to visit any suburban shopping mall today and to see the wide variety of eyeglass frames now available. Frames have become hot fashion accessories just like jewelry or shoes, and the wearer can change them to match moods or to convey an image. The ancient Greeks made the first studies of vision and the workings of the eye. They also attempted to understand magnification and to use it to understand vision problems. Alhazen, an Arabian scientist who lived during the eleventh century, studied the refraction (bending) of light and the connection between optic nerves and the brain. It was the thirteenth century Polish scientist, Vitello, who first understood that the shapes of lenses could be used to control the focus of light rays. In 1257, the English friar Roger Bacon explored so many aspects of science that he was imprisoned by the monks of his Franciscan order who were suspicious of his knowledge. While he was in prison, Friar Bacon sent Pope Clement IV some magnifying lenses for reading; despite Bacon's controversial standing, the monks who labored over detailed manuscripts and copy work quickly adopted the use of his spectacles. Bacon's work occurred at the same time as that of Salvino d'Armato of Florence, Italy, and several Chinese and German scientists. All can be thanked for their collective invention of spectacles. The invention of devices to keep spectacles on the nose took several more centuries. And, despite Ms. Parker's rhyme, style and a variety of lens shapes and frames have been important since the beginning of eyeglass frames. The earliest eyeglasses were unframed lenses that were simply held by hand in front of the face. Alternatively, two lenses were mounted in a half frame that could be held with one hand. Spectacles also were attached to hats or tied around the head with bands made of leather or ribbon. Will Somers, a jester to the court of Henry VIII, sported a suit of armor with spectacles attached to the metal helmet with rivets. The painter El Greco portrayed Cardinal Niño de Guevara wearing glasses with cords that looped over his ears. The seventeenth century design called the forehead frame consisted of a metal band that encircled the head and had metal frames mounted to it. The most common frames held two lenses on a frame that rode on the lower part of the nose. Lightweight materials were used to lessen the burden and pinching of these "nose frames." In the court of the Spanish King Philip V and Queen Marie-Louise (about 1701), all 500 of the queen's ladies-in-waiting wore tortoise-shell frames because of their light weight. This style saluted both fashion and superstition; the frames supposedly brought good luck because the tortoise is sacred in China. Attempts at stylistic designs were varied and clever. The bridge pieces that rest on the nose were decorated in endless ways. Lenses were mount-ed in fans, watch fobs, and on walking sticks. The status-conscious had their nose frames made of gold or other precious materials or employed artists to decorate the frames with coats of arms. Other than nose glasses, lens wearers could choose the monocle (a single lens in a frame or holder), the lorgnette (a pair of lenses with a nose bridge and a single handle on one side), a quizzer or quizzing glass (a monocle that was mirrored so the wearer could see to the rear as well), the perspective glass (a single lens worn on a ribbon and used for distance vision), or scissors glasses that had two eyepieces mounted on a hinged handle that was held up in front of the nose. Finally, in 1728, Edward Scarlett of London developed temples for frames. These clamps gripped the temple area and held nose glasses more securely to the face. A loop at the end of each temple piece held ribbons that were tied around the head or wig. By the 1880s, temples were curved to extend and fit over the ears to hold spectacles in place. In the Colonies, spectacles were imported and were very expensive until American glass-making skills improved enough to develop an eyeglass trade. Just as curved and fitted temples were developed and adopted all over the world, fashion reverted to a style called the oxford that consisted of nose glasses improved by a more elastic and wearable bridge. These glasses were also called pince-nez and had nose pads fitted to small springs on the flexible bridge. Presidents Teddy Roosevelt and Calvin Coolidge wore oxfords. During the 1900s, simple steel-framed glasses were the most common, although less expensive frames were available in a material called gutta-percha—a rubbery plastic-like substance. Tortoiseshell and horn-rimmed glasses became popular in the 1920s and 1930s, but many of these frames were actually made of celluloid, an early plastic that could be dyed and molded to resemble animal horn or tortoise shell. Steel-framed spectacles and sunglasses were issued to millions of servicemen during World War II. The business of manufacturing eyeglass frames and lenses made its most dramatic leap in the twentieth century with the rise of plastics. Plastic lenses are lighter in weight and can be manufactured as bifocals, trifocals, and quadrifocals to correct a wider range of vision problems. Frames made of plastic are also less expensive. A broad range of styles and colors can be made in plastic and changed to suit wardrobes, fads, and moods. Sunglasses also became affordable, thanks to the plastics industry, but Hollywood was responsible for their popularity. Large, square-rimmed glasses like those worn by Clark Kent became popular among men in the 1950s, and the ladies favored "cat's-eye" glasses that angled up at the temples. Granny glasses with fine metal frames accompanied the flash of the "flower power" generation in the 1960s and may have been responsible for making antique eyeglasses popular collectibles. Although contact lenses were also developed during this century and have become very popular, the variety of available eyeglass frames has kept glasses fashionable. Eyeglasses frames are typically made of either metal or a type of plastic called cellulose-acetate. Cellulose acetate is derived from cotton and is flexible and strong. It is produced in long narrow sheets that are slightly wider than eyeglass frames. The sheets are up to 3 ft (0.91 m) long and 0.33 in (0.84 cm) thick. Eyeglasses manufacturers may retain their own staff of designers or use outside consultants to design frames. The consultants often include fashion designers, who create their own lines of eye wear that change along with trends in clothing design. The designers' names are important in selling eyeglasses and especially in interesting fashion-conscious buyers in multiple pairs of glasses or sunglasses. There are definitely trends or fashions in eyewear including light- or dark-colored frames, thick or delicate ones, and decorative shapes or ornament-bearing styles. Specialized frames for children and half-frames for reading glasses are also designed with an eye to style. Blanks for plastic eyeglass frames are die cut from sheets of cellulose-acetate. pads on the glass's rest. Three eye sizes are standard for the range of dimensions of corrective lenses. Each style is typically manufactured in four different colors, so a single style will result in 12 combinations of color and dimension. Frame designers and manufacturers typically produce a new style every few months and discontinue styles if they don't sell well. 1 After the design is decided, a die is made out of steel and is fitted in a blanking machine that punches blanks out of the sheets of cellulose-acetate. The edges of the steel rule die are sharp, and the dies have protruding rods that are used to remove the punched fronts where the lenses will be fitted. The acetate sheets are brought from a cool storage area to the blanking room where they are heated in small ovens to about 180° F (68° C) to soften the plastic. The soft sheets are fitted into a blanking machine, and, under several tons of pressure, the die cuts through the plastic to produce a blank. The machine is automated to lift the die and move it to the next portion of plastic. The blanks are produced quickly while the plastic is soft. The blanks are then removed from the sheet, and the lens portions are taken out of the frames. The lens blanks become scrap. 2 The blank frame fronts are finished in a series of operations. Grooves to hold the lenses are cut using a router. The frame is held tightly by a holding fixture made of aluminum and consisting of two pieces. The fixture is fastened around the frame and pressed against the router blade. The grooves are cut to 0.16 in (0.41cm) wide, which is an industry standard. If thick lenses are needed, they are ground down along the edges to fit the routered grooves. 3 The frames are then smoothed to remove rough edges by two different abrasive machines. One machine is specially shaped to smooth the edge of the frame that rests on the cheek and the second smoothes the area around the nose. The frame is then secured in a vise-like device while the nose pads or attachments that hold the nose pads are glued to the frames. Once the glue is allowed to cure for 24 hours, the glued areas are also smoothed. After the frames are smoothed, the temples are attached to the frames with a metal hinge. To make the temples, plastic temple strips are heated, and a narrow strip of steel called a core wire is also heated. When the right temperatures are reached, a core wire is inserted into the center of the softened temple. complementary materials to match the fronts. The temples may be flat with angular edges or rounded in shape, depending on the frame style. The temples are heated, and a narrow strip of steel called a core wire is also heated. When the right temperatures are reached, a core wire is inserted into the center of the softened temple. Inexpensive glasses, like some non-prescription sunglasses, may be made without core wires, but they will also be less strong. 5 To attach temples to their frame, small slots are cut in the upper comers of the frame. A half of a metal hinge is put in each slot, and the frame and partial hinges are placed in a capitron machine. The capitron machine induces ultrasonic vibrations in the metal hinges and creates heat of friction. The friction causes the plastic of the frame to melt locally around the hinge to bond the hinge to the frame; this process is more secure than gluing or other types of bonding or mounting. 6 The fronts with hinges are then imprinted with the manufacturer's name or logo, the name of the style of the frame, and the size of the frame. Before the temples are attached to the frame, an angular fit is needed to make the frame front tilt inward toward the wearer's face from top to bottom. An automatic saw is used to cut the correct angles in the upper edges of the front. Caps are fitted over the hinges, while the front is polished. By this stage, the fronts are still flat with sharp edges except in the routered areas where the lenses fit. In the polishing room, hundreds of fronts at a time are tumbled in a drum with pumice (soft stone that is ground to a powder and used as an abrasive) and small maple pegs that look like miniature kitchen matches with rounded edges and tips. The pumice adheres to the pegs, which grind against the fronts during a 24-hour-long process that smoothes the rough edges. Crushed coconut shells are sometimes used by manufacturers in the polishing process. 7 The smoothed fronts now have to be shaped to fit the curvature of the face. They are. heated in an oven, mounted in a curved forming die (similar to the blanking die used to make the fronts), and placed in a press. Pressure is applied for about 30 seconds to produce a uniform curve in the front. The warm front is dipped in a cold water bath to harden it to the curved shape. 8 The shaped fronts are returned to the polishing room where they pass through a series of tumbling drums over a period of four days to add the finished sheen. Each drum contains pumice that is finer than the previous one; the final drum holds polishing wax. All of the polished fronts are inspected carefully for any scratches. They are placed individually in envelopes and filed by size, style, and color. 9 Depending on the shape and style of the eyeglasses design and their temples, the temples are then ground and shaped during several operations. Grooves are cut into the ends of the temples, and the matching halves of the hinges are riveted into the temples. The ends are cut to match the angles of the finished fronts. Like the fronts, the temples are then finished during multiple operations, and pairs of polished temples are packed in envelopes by size, style, and color. Manufacturers store the envelopes containing fronts and temples until optometrists or optometric supply houses order them by size, style, and color. Sets of fronts and temples are then shipped. Eyeglasses frames must be manufactured with great attention to detail because they are critical in supporting lenses to improve vision, they must be comfortable for the wearer, and they are an accessory to professional dress and personal style. Although processes for making frames are performed by machines, operators are responsible for each step and are quality control checkers for their particular operations. The eyeglasses industry has become highly competitive because of the aspects of fad and fashion involved, but operators are well aware that their products provide vision care. 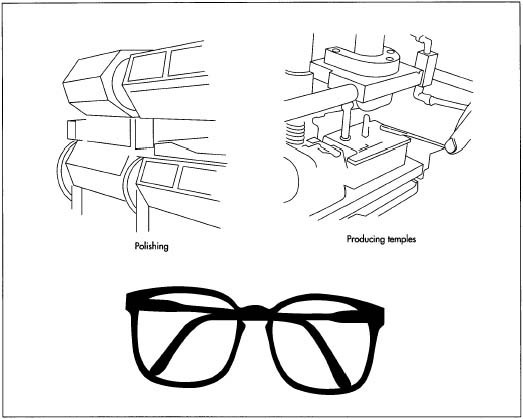 Fronts and temples for eyeglasses can be rejected at any step in the process of manufacture. No byproducts result from the manufacture of eyeglass frames. Plastic waste is generated during blanking, with the bulk of the waste from the lens portion of the frame that is cut out. This waste is carefully collected and recycled. The past 50 years of eyeglass history have soundly established the future of frames. Despite the popularity of contact lenses and the advent of laser surgery to correct vision problems, many people will find eyeglasses necessary or desirable for their personal needs. Improved technology in the manufacture of plastic lenses and frames and in the comfort of fitted frames have made eyeglasses more enjoyable to wear. The fashion industry also actively supports eyeglass frames as an added avenue for expressive designs and a popular method of stating personal style. Corson, Richard. Fashions in Eyeglasses. Dufour Editions, Inc., 1967. Goldstein, Margaret J. Eyeglasses. Minneapolis: Carolrhoda Books, Inc., 1997. Gottlieb, Leonard. Factory Made: How Things are Manufactured. Boston: Houghton Mifflin Co., 1978. Kelley, Alberta. Lenses, Spectacles, Eyeglasses, and Contacts: The Story of Vision Aids. New York: Elsevier/Nelson Books, 1978. York, Alan. "Eyeglasses: Fads and Fashions in Spectacles." In The Encyclopedia of Collectibles: Dogs to Fishing Tackle. Andrea DiNoto, ed. Alexandria, VA: Time-Life Books, 1978. Morais, Richard C. "Luxottica's golden spectacles," Forbes (May 20, 1996): 98. The Antique Spectacles Home Page. 9 September 1998. http://web.ukonline.co.uk/christopher.ridings/ (March 11, 1999). University of Waterloo Museum of Visual Science and Optometry. 6 December 1996. http://www.optometry.uwaterloo.ca/-museum/ (March 11, 1999). I found this a highly readable and informative article on an interesting niche subject, giving an insight into what is a more elaborate process than one might imagine. Could the author please say what specification of adhesive is best suited for rejoining a cracked frame (which I assume would be similar to that which you say is used for the nose-pads)? I have many frame designs and would like to locate associates to launch a line. How can custom made frames be fabricated statesides? Thanks for your article. I recently got a pair of spectacles with new frames and found that the frames had a very strong chemical scent. I only noticed after my face began itching and my throat began to tighten. Is there a probable explanation for this? Thank you kindly for a response.